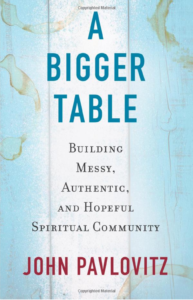 This is the first in a short series of blog posts about Decatur Presbyterian’s journey through the book A Bigger Table, by John Pavlovitz. This book is on the reading list for Rev. Dr. Todd Speed’s sabbatical this summer. All are invited to join in reading the book, following along in this blog, and joining in the live conversation Sunday mornings in June. First of all, let me say that I’m glad you’re participating, in some way, with the DPC Summer Book Club. This idea came out of my desire for us, as a congregation, to learn alongside Todd while he’s on sabbatical. So, I took Todd’s reading list and asked the Adult Faith Formation Committee to help me choose one for us to read. As he tweaked his sabbatical plans, Todd’s list got longer but this is the book chosen by the committee. I was drawn to it by the premise and the discussion questions in the back. No matter your theological framework, John Pavlovitz asks good questions. He is a thoughtful pastor with what I see as a genuine desire to extend God’s grace far beyond whatever boundary we’ve intentionally or unintentionally set for ourselves. So, if you’re reading the book, following along with this blog, or reflecting upon the discussion questions I pray that God will use this experience to speak to you in a new way whatever that way may be. After reading the first five chapters of the book, I find many things that hit home for me and in addition to the questions he asks I have some of my own. Because the first section of reading was long, I won’t be able to cover it all here. So, let’s get started. The first sentence of chapter 1 hit me right between the eyes. I could have written it myself. “Before I knew better, I assumed that everyone had a seat at the same table that I did.” (p. 3) The idea that the table should be bigger assumes that the table is small to begin with. Now, I see the image of the table in several different ways. The table of grace, the communion table, the metaphorical table where God’s family sits, etc. It’s a good image, I think. And we know that there are plenty of tables in this world that are limited, that are small, that require an invitation, and that do not include all of God’s children. The challenge at the beginning of this book is to think about your own experiences growing up in the world, your family, your neighborhood, and the church, if you grew up in church. How have your earliest experiences shaped your vision of the table? Is it small? Is it big? Could it be bigger? Who doesn’t have a seat? I will readily confess that before I knew better, I assumed that everyone had a seat at the same table I did. I grew up in a two parent household in an affluent part of North Texas. I grew up in a predominantly white neighborhood and I can count on one hand the number of persons of color in my high school graduating class. The church where I was raised is also predominantly white and incredibly wealthy. And as most children do, I thought this was everyone’s experience. I didn’t know that not everyone had a seat at the same table I did. I see it now. I know now that not everyone had a two parent household in a nice neighborhood. I know now that not everyone grew up in church let alone a large wealthy one. I see the privilege that I carry with me and I see the need for a bigger table, a much bigger table. Similar to John, my experience of God and family was positive. What was yours? As he says, “all of us are the products of our individual stories: the place we’re born, the home of our youth, the experiences we have, the education we receive, and the people who frequently speak into our lives. Our specific, never-to-be-duplicated history shapes the way we see the world, the way we understand ourselves, the way we think about God.” (p. 6) I encourage you to think back on your own growing up experiences. What was home like for you? What was church like for you? Who was God for you? When was the first time you met someone completely different from yourself? Did that experience change you? If so, how? Pavlovitz shares some of the experiences he had as a young adult which caused him to question some of the assumptions he’d made early in life. He encountered and built relationships with people who were very different from him. He says that these experiences helped him question and then clarify his faith and theology. Have you had any experiences like that? What experiences have you had that have transformed your faith and outlook on the world? What relationships in your life have transformed your faith? For me, seminary and the relationships I built there were transformational. The same is true for my time as a chaplain in hospitals and serving as pastor in a rural congregation. The more I experience and build relationships with those who aren’t like me and didn’t grow up the way I did, the bigger my table becomes. My faith has been challenged along the way and I’m grateful for it. As my eyes are opened to experiences outside of my own, I am better able to see the people I meet as neighbors and I am better able to see deep need and injustice in the world. The more I am able to see that God’s love is not exclusive to me and those like me but is for everyone. Pavlovitz talks about the deconstruction of his faith that began slowly when he realized not everyone gets a seat at the table. His experiences with people different than him helped start this process. He doesn’t see this deconstruction as a bad thing and, in fact, he encourages asking questions about our assumptions, our faith, and what we hold to be true. I believe questions about faith are good. I think it’s important for us to ask questions, to learn, to investigate and to pray when it comes to matters of life and faith. We do this in community and we ask questions of our community. Building a bigger table isn’t just an exercise for us as individuals. It’s a task for us as a faith community, as well. Who is welcome at DPC’s table? Who might be missing? I want for us to hold these questions in our hearts as we go on this journey together. Next week’s reading assignment is chapters 6-10. I hope you’ll join me.